Bouchet P., Rocroi J.-P., Frýda J., Hausdorf B., Ponder W., Valdés Á. 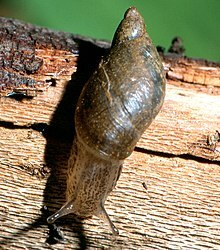 & Warén A., 2005, Classification and nomenclator of gastropod families. Malacologia: International Journal of Malacology (Hackenheim, Germany: ConchBooks) 47(1-2): 1–397. For more multimedia, look at Stylommatophora on Wikimedia Commons. This page was last edited on 14 March 2018, at 20:46.